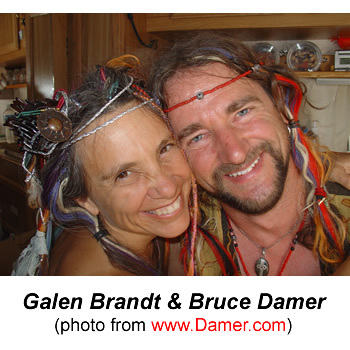 Terence McKenna once called Bruce Damer “a visionary’s visionary,” and Bruce certainly lived up to that reputation in his 2003 Burning Man presentation. Combining subjects as diverse as evolution, psychedelic experiences, and physics, he builds a mental construct to rival Olaf Stapleton’s classic workStarmaker. In addition to Bruce’s ideas about a conscious universe, we were also treated to an inspiring rap by his wife, Galen Brandt, as she explains the lure of the Burning Man experience. Posted in Bruce Damer, Burning Man, Consciousness, Creativity, Eschaton, Evolution, Extraterrestial, Palenque Norte and tagged Bruce Damer, Burning Man, Consciousness, Creativity, Eschaton, Evolution, Extraterrestial, Palenque Norte.